The Paperartsy challenge for hearts has had lots of inspiring posts that I'd love to try... like stamping on fabric or clay... but I just don't have the time right now. 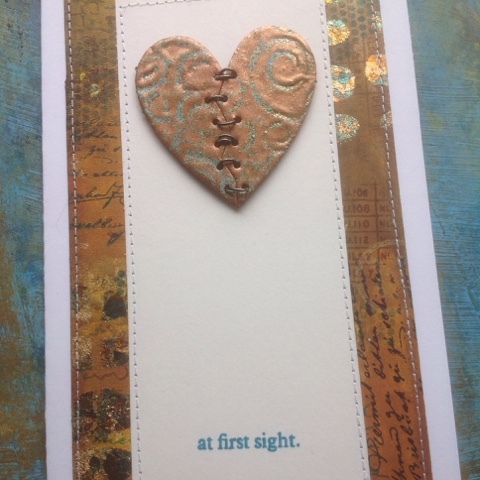 Looking at this recent post with a valentines card in browns and blues I realized I had the ingredients lying on my table: a chippie heart with copper embossing powder and a brown/teal masterboard from last year. 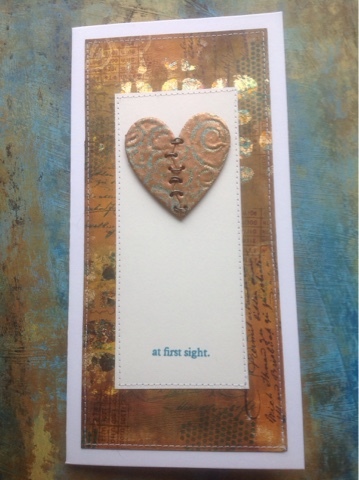 Besides Paperartsy, I'm also posting for the SanDee & amelie's Steampunk challenge. Beautiful card, your border is perfect ! thank you for your participation at Sandee & Amelie steampunk challenges. Great job with the heat embossing on the heart! It looks amazing! Thank you for sharing your wonderful steampunk project with us at SanDee&amelie's Steampunk Challenges!